During a break in the action, I looked over at a panoramic view of a beautiful sunset, and though I wasn’t clear on whether or not I was authorized, I crossed the room and walked through the French doors out to the veranda. A chain link fence separated the expansive backyard from the ocean waves that calmly lapped the beach. With the picturesque sunset, the fence was an eyesore, but I suppose security’s got to be tight at the Head of State’s house. 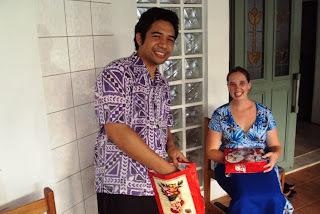 Samoa has two national leaders: the Prime Minister, which is an elected position, and the Head of State, which is something more akin to the Queen (or King, in this case) of England. The position is more of a figurehead than a governor. Before today, I’ve seen the HOS 3 times: he made an appearance at the 4th of July party, he attended the girl’s rugby game at Apia Park that I attended with my host family, and he was a central figure at the National Memorial Ceremony after the tsunami. 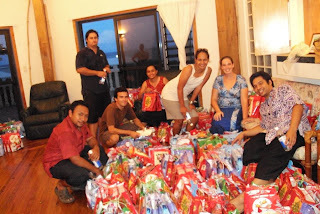 In any case, the HOS is throwing a Christmas party for children living in tsunami-affected areas, and he called on a number of service organizations—Rotary, the Lion’s Club, et al.—to help organize the event. I’ve been getting more and more involved with the Apia chapter of Rotoract, the Rotary club’s youthful counterpart, and we’ve been tapped to man the food tents at the event, which will be held tomorrow. We were also asked to come help stuff gift bags tonight. 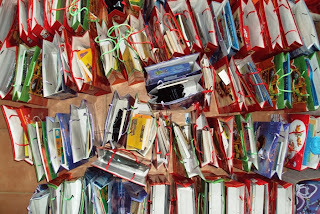 Initially we stuffed the gift bags with small stacks of books—Harry Potter coloring books, young adult novels, comic books, etc. There was some effort to separate the bags into girl bags and boy bags, but as the evening wore on and the number of bags became more unwieldy, the separating line was blurred. 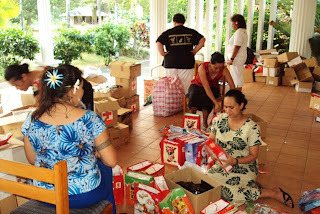 We bunched the bags in groups of 5 to aid in keeping tally and laid them out in improvised rows across the entry way of the HOS’s house. 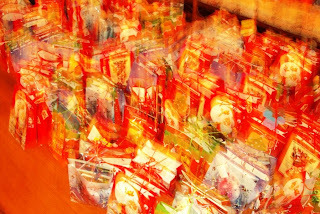 Then stuffers came through with candy, tossing handfuls into each bag. Having the bags all tied together in groups of 5 made it difficult to toss candy in logistically, but by that point I’d been tasked with keeping tally of the number of bags stuffed. I dodged candy duty. Someone brought a large cardboard box filled with stuffed animals into the room, and 2 guys went around choosing stuffed animals and dropping one into each bag. Once a bag had books, candy, and a stuffed animal, it was complete. I caught a ride with Ainsof, the current president of Rotoract, this afternoon. He told me they’re expecting approximately 900 children at the event tomorrow, although I heard from someone else the number could be as large as 1,200. When the dust settled, we’d stuffed 1,083 bags. So let’s hope the 900 estimate is more accurate. Either way, I’m looking forward to tomorrow’s event. I think it’s going to be a good time. Ainsof and Blakey hard at work. Group photo with stuffed bags. I'm not sure who took this picture, or how they took it. But it's, like, totally psychedelic, man. I hope there's more stuffed bags then kids too.